Shirts With Random Triangles: Georgia Officially Names Mel Tucker As Its New Defensive Coordinator. Georgia Officially Names Mel Tucker As Its New Defensive Coordinator. 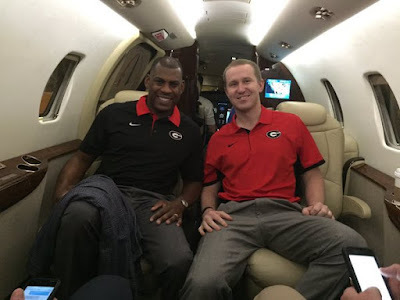 Mel Tucker and Glenn Schuman. Image via @CoachSchuUGA. HT: dogbytesonline,com. With Alabama winning it's 25th 16th college football title in the 2016 College Football Playoff title game on Monday comes the official departure of the Crimson Tide's now-former defensive coordinator Kirby Smart for his new role as head coach of Georgia. Smart's not leaving alone, as now-former Alabama defensive backs coach Mel Tucker has been officially named as Georgia defensive coordinator. A photo of Tucker was taken Tuesday morning on a plane headed to an unnamed airport in Georgia. He was accompanied by fellow Alabama defector Glenn Schumann, now an UGA defensive assistant. Schumann posted the photo on his Twitter account. Tucker served as a member of Alabama head coach Nick Saban's coaching staff during the 2015 college football season. Saban and Tucker have a history together, as Tucker began his coaching career as a graduate assistant on Saban's coaching staff at Michigan State in the 1997 and 1998 seasons. From there, he went on to serve as a DB coach for several schools, beginning with Miami (Ohio) in 1999. That was followed by a season at LSU in 2000 as a member of Saban's first coaching staff with the Tigers, then three seasons as DB coach for Ohio State from 2001-2003. Between 2003-and 2015, Tucker served as assistant coach in the NFL from 2005-2014. His NFL coaching career began with the Cleveland Browns, serving as a DB coach in the 2005-2008 seasons, and as DC in 2009. Tucker went on to serve as a DC for the Chicago Bears for 2013 and 2014 seasons, and as DC for the Jacksonville Jaguars during the 2009-2012 seasons. Tucker also served as the Jags' interim head coach for the final five games of the 2011 season.